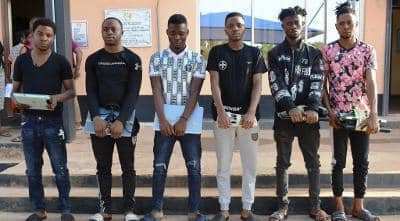 Operatives of the Economic and Financial Crimes Commission (EFCC) Ibadan Zonal Office, on Tuesday, March 26, 2019 swooped on a location suspected to be a hideout of internet fraudsters following series of intelligence from residents of the area on their alleged fraudulent activities. The early morning raid on apartments within the Kolapo Ishola Estate, in Akobo area of Ibadan led to the arrest of six youngmen between the ages of 24 and 30 years. The suspects include: Tella Adefemi Ibrahim, Awoniyi Adeseye Abiodun, Oladele Olawale Wasiu, Olabiti Afeez Ajibola, Akeredolu Oluwafemi Temidayo and Oyaremi Olalekan Olabode. 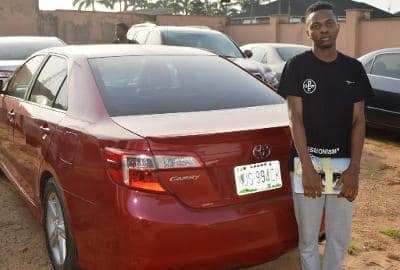 At the point of their arrest, EFCC operatives recovered five different models of exotic cars, laptops, mobile phones and several documents containing false pretences from the suspects. They will be charged to court as soon as investigations are completed. Where r d exotic cars?? ?